Chicory has curly, bitter-tasting leaves, and resembles endive. The leaves are often used as part of a salad or cooked as greens. It is available year-round. Choose leaves that are brightly coloured and crisp and store, refrigerated and unwashed in an airtight container for up to 3 days. Did you know that roasted chicory which is also known as “succory” is used as a coffee substitute. It is also added to some coffees. Escarole looks like a flattened, disheveled butter head lettuce. The curving and ragged chewy leaves of this green vegetable are broad and loose. The leaves are a dark green at the top and the crisp-textured smooth leaves are paler in colour near the stem. The inner leaves are especially tender and delicious. This refreshing green delivers a sharp bitter bold flavour. 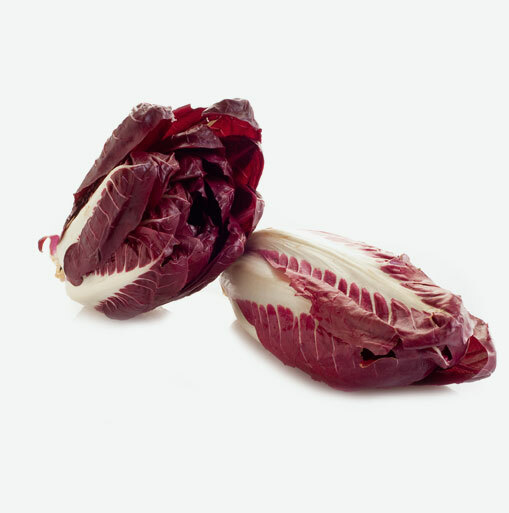 Radicchio which is pronounced rahd-EEK-ee-o, has beautiful, dark burgundy flashy shiny leaves with contrasting white ribs. This extremely attractive deep red round-shaped vegetable resembles a small head of cabbage. The satiny, crisp pretty leaves have a very distinctive bittersweet flavour. These salad greens are an excellent source of folate. They are excellent sources of vitamin A, vitamin C, calcium, and some potassium. Chicory, escarole and radicchio are low in calories and high in fiber. These veggies help to promote overall good health. When choosing any of the above three vegetables, select heads that are crisp, brightly coloured and not wilted. They are perishable greens so it is best to use them the same day of purchase or wrap each one individually and refrigerate for up to three days. Unless the greens you purchase are labeled as pre-washed, all greens need to be washed before using them. For some, this means a light rinsing (e.g. tender mâche and butterhead) and for others, a more vigorous and thorough cleaning is needed to remove all of the dirt, sand and insects that may have gotten buried inside the head. Many greens also need to be trimmed of thick stems. Wash your leafy greens just before cooking. Remove the root ends if they have any and then chop coarsely. You can add these greens to salads, enjoy them sautéed with extra virgin olive oil and some minced garlic. You can also add them to soups, stews and pasta dishes. Should you cut or should you tear your green leaves? Tearing greens produces a rustic, appealing appearance. Cutting them is usually acceptable but make sure that you are using a stainless steel blade otherwise, some other knives may cause blackening of the leaves and change their flavour. Always cut your greens just before serving so that it minimizes their blackening. Firmer, darker and more strongly flavoured greens are better cooked or steamed which sweetens their flavour and tenderizes them.